An exciting new savings opportunity is launching this tax season: the ability for all taxpayers to save a portion of their tax refund into U.S. Series I Savings Bonds. You don’t need a bank account to save some of your refund with bonds. And the best part is you can use a portion of your refund to gift bonds to your loved ones. Savings is hard, especially in this economy, but tax time savings bonds provide an easy, simple and accessible opportunity to save a little bit today for your future and the future of your loved ones. 1. You only need $50 to get started. Choose to save as little as $50 of your tax refund with a bond. 2. Tax time makes it simple. Just choose the amount you want to save and you’ll receive your bonds in the mail. 3. You earn interest right away. Your money starts growing immediately. 4. Bonds are safe. U.S. Series I Savings Bonds will never lose value and are backed by the U.S. Government. 5. Bonds have no fees. There are no fees to buy or cash in your bond. 6. Gift savings to your loved ones. Bonds can be purchased in someone else’s name – so you can help jumpstart the savings and dreams of the people you care about. TurboTax customers can follow the simple directions in product and elect to save a portion of your refund into U.S. Savings Bonds for yourself and your loved ones. 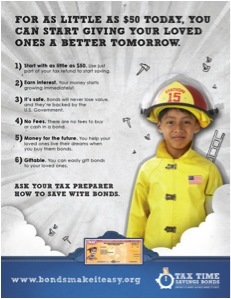 To learn more about tax time savings bonds visit www.bondsmakeiteasy.org. This is a guest post by Sakira Abbi. Sarika Abbi is a Savings Initiative Specialist at Doorways to Dreams (D2D) Fund, a non-profit organization working to help all families improve their financial security. 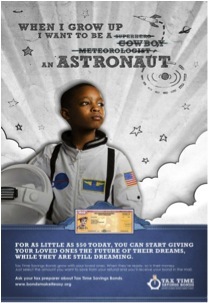 D2D Fund, in collaboration with its partners, launched the campaign “Saving is Hard. Bonds Make it Easy” to build awareness of tax time savings bonds and to help encourage all Americans to invest a part of their tax refund in U.S. Savings Bonds. I want to add that the interest earned is not taxed at the state and local levels, there is NO principal risk and these type of savings bonds (Series I) And there are education benefits as well!